1 minute, 50 seconds Tom Upgraded - Learn Why. “The order processing in Nexternal is much better than the osCommerce system we had been using. Accepting orders, printing packaging slips and invoices is very streamlined. Product catalog management is easier to use and does not require web language specific knowledge. Leo Joy - Pro-Lens, Inc.
Watch the Video Turnkey. Highly technical. Watch the Video Yes. Dedicated Customer Service Rep. Unlimited support. None. Community forums. Watch the Video Yes. Add-on module required. Watch the Video Yes. Real-time rates, label creation, and tracking with all major carriers. Add on module with rates only. Watch the Video Yes. Mobile Friendly Catalog & Checkout. Available Through 3rd Party Add-on. Watch the Video 10 XML Tools Available. Not available. Bulk Data Import Yes. Import products, categories, customers, and coupons. Not available. Batch Order Processing Yes. No. Backups Managed by Nexternal. Responsibility of Merchant or Web Host. Reliability Nexternal hosts and maintains the application with 24/7 monitoring. osCommerce is hosted by a third party. Reliability varies. Software Updates Automatic and frequent. Merchant must download, install, test, and maintain. Automated Review Reminders Yes. Must Purchase Seperate Module. Trust Guard Yes. Scanned daily. Merchants can display badge. Not included. Customer Based Pricing Yes. Price products by customer type. Not available. Affiliate Program Included. Add on module. Marketplace Feeds Automated - run daily. Must manually create data files. QuickBooks Integration Included. Add on module. Storage Limits None. Depends on host. Product Limits No. Varies depending upon hosting. Backend User Access Levels 7 different access levels available. One level only - Administrators. osCommerce is a Trademark of osCommerce. 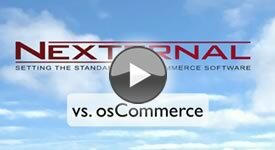 Information was collected from osCommerce's website (www.oscommerce.com) in order to compare it to Nexternal's shopping cart application. To report an error or discrepancy, please email .